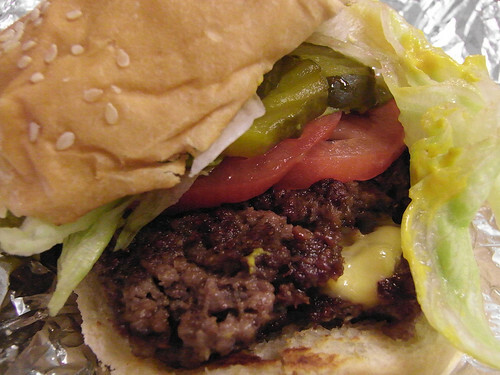 Five Guys have been popping up all over the city and outer boroughs, and after reading Adam's review it seemed like the least we could would be to check out the nearby LaGuardia location. We did not have high expectations of the Washington DC chain, so we were pleasantly surprised by our lunch. The loosely made meat patties come two to a standard order with condiments and toppings supplied per individual request. The whole affair of char-grilled burger edges, squishy bun and a high pile of toppings is a rather messy lunch but ultimately satisfying. Five guys rocks. Although, its really hard to get back to work after such a hardy lunch. You gotta try the fries they are awesome! Oh, and don't order a large unless there are 4 of you. Oh we couldn't have burgers without fries! We tried those too (thankfully a small size), they are/ were really nice! That looks amazing! I'm hoping to go to grad school out near NYC and then I could go to all these places! I ate at a Five Guys in Virginia and loved it! I am kind of glad they don't have any near where I live in Colorado to keep the calories away...Don't think I could resist it !